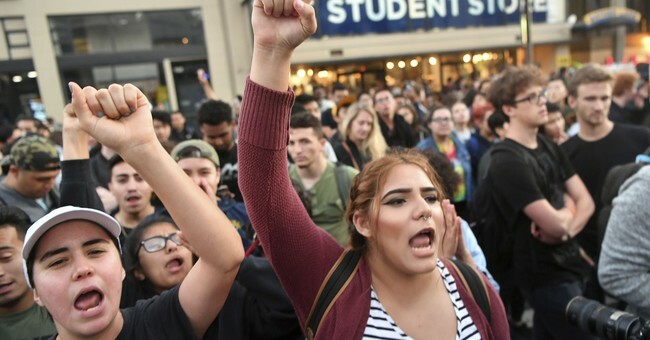 A disturbing new poll shows that a full 19 percent of college students think that it is acceptable to use violence to disrupt a speaker who is saying "offensive and hurtful" things on campus. This number is slightly higher among students who identify as Republican compared to Democrat students (22 to 20 percent), and is significantly higher among male students (30 percent) versus females (10 percent). The survey was conducted by John Villasenor, who is a senior fellow at the Brookings Institution as well as a professor at UCLA. The poll also found that nearly 40 percent of students do not believe that the First Amendment covers "hate speech" (which it does), and that slightly over half of the students surveyed believe that it is okay to shout down a speaker who is making controversial comments so that they cannot be heard. Unlike the question that concerned the use of violence to stop a speaker, this question found that significantly more Democrats (62 percent) were in favor of this technique compared to Republicans (39 percent). The poll was taken over the last two weeks of August. Obviously, none of this is okay. On public universities, free speech must be protected lest it get taken away for everyone. It is not up to students to decide which speech is acceptable for others to hear and what is unacceptable. That's not their job, and violence is never okay, period.